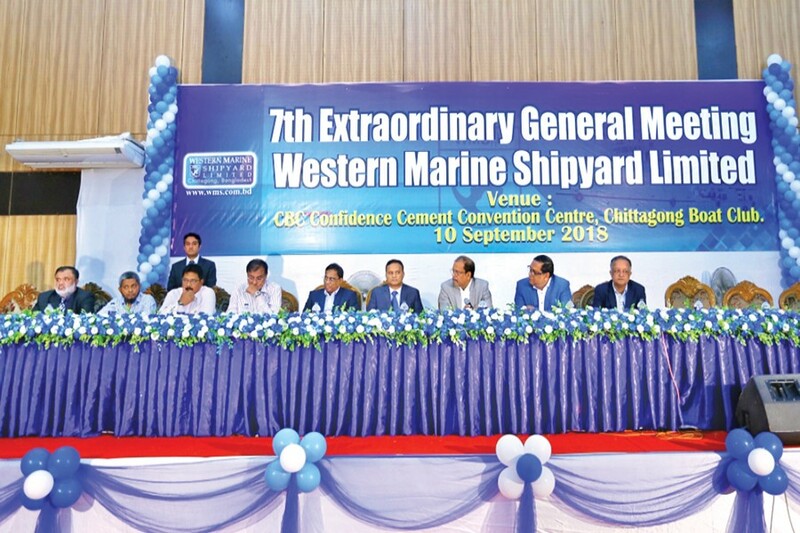 CHATTOGRAM, Sept 12: Western Marine Shipyard (WMS) held its seventh extraordinary general meeting (EGM) at the Chittagong Boat Club in the city recently with participation of general shareholders. The company's Chairman Saiful Islam, managing director Sakhawat Hossain and other directors of the board were present in the meeting. Mr. Islam expressed gratitude to the shareholders for their confidence on the WMS, a leading shipbuilder of the country. He proposed to revise the issue price and ratio of the rights share issue at 1R:2 (one right share for every two existing shares) at Tk 15 each (including a premium of Tk 5.0 each) instead of the earlier recommended 1.25R:1 (five right shares for four existing shares) at Tk 20 each (including a premium of Tk 10 each). The shareholders approved the proposal and thanked the WMS management for such proposal, according to a statement.